So, my Fall Felted Bag Exchange pal has questions. Questions: what is your preferred sock knitting method and what needles do you use? Also, favorite sock yarn or one you want to try? Well pal o’ mine, I like anything BUT Magic Loop. Which is to say, I like dpns a lot, but two circs are so easy to travel with that I guess they are in the #1 slot. Needles? Addis and KnitPicks. I thought I was all about metal, but of late, I’ve been into wood and bamboo. ANYTHING bamboo appeals to me, because it’s the ultimate renewable resource. The stuff makes Virginia Creeper (read: kudzu) look like a slow grower. I’m also really liking the toe-up approach to socks, just for the record. Favorite sock yarn. Okay gentle reader, I know I’ve professed my love for about ten different sock yarns, but honestly, Tofutsies has to get the #1 slot. For merino/superwash, I’d go with Lorna’s Laces or the local Misty Mountain, both available at the Loopy Ewe. Heck, if all else fails, if you can buy it there, I’ll like it. Wick is the only worsted weight sock yarn for me, although I might be trying some others in the holiday knitting rush, which I do believe is upon us. The simple fact is, I love wee little skinny sock yarns. I want to try them all. And now, I have to walk away from this idiot box, so that knitting can actually take place. Can you see the cute little cherries on the ribbon? Squee! I hope my pal will enjoy that little touch. The package is ready to ship out tomorrow, save a note and some tissue paper. But let m e tell you, CotLin is the only linen of any blended sort for me. Sigh. It slides on through, comparable to any of the ” – & dairy product” cottons, and I bet one wash would find it snuggly soft. I see a fitted item for me in this very color, maybe, next spring. Try it for the extra-special cloths you might be giving as gifts, or treat yourself; you deserve it! I am amazed at how it costs less and feels worlds better, but don’t take my word for it. Order some and try it for yourself. In case you missed it the first time, this is Amanda’s “Mandy’s Candy Bag” pattern. You can also find it on Ravelry. Whew. Wow. I’m shocked. After Monkey #2, which should be done within the next week, I will have time to cast on for the Knight’s birthday (or Christmas if I miss the first deadline) surprise, my felted bag pal’s bag, finish my Summer Daze Tofutsies, and begin holiday knitting. The light at the end of the tunnel isn’t a train! Now, to cast on for that #2. I love a contest. However, I’m practicing some rebellion skills here, as the sole hostess knows she’s my pal, so she’s getting NOTHING for #1, even if it does disqualify me. I’ve picked out the pattern and know what colors I’m using, and that’s the only hint she’s getting. 1. What is your favorite yarn for felting, and why? Grins. Regular readers can answer that. Patons SWS, because it felts quickly and beautifully, comes in great colors, and is a soy-wool blend. 2. Name one person in the swap who is not from the U.S. and tell us where they are from, and link to their blog. 3. Find one person in the swap who has a dog, and let us know the name of their dog(s) and link to their blog. Michelle has Murphy and Chewy! 4. Find one person in the swap who has a child or grandchild and link to their blog. 5. And finally, tell us if you like October or November more, and why! October holds all kinds of goodness. The dear Mugsy has a birthday. One of my brother inlaws has a birthday. Our anniversary is in October. Anne’s birthday is in October. Love those changing leaves! It’s cool, but not COLD yet, for the most part. How long have you been knitting or crocheting? How did you learn? or from whom? Well, we’re up to about nine months right now of serious knitting. I learned as a youngster, but never did a single project, save a dog blanket that was too small for any of our dogs. Anne piqued my interest last Thanksgiving, and the rest is history. What was your first felted object, and why did you decide to try felting? My felted needle case. You can see my first felting projects (and Mugsy) here. What are your favorite colors? Any you hate? In general, reds, pinks, blues, greens, browns, teals… Heck, let’s just say anything but orange and road sign yellow, okay? Oh my. For daily use, a wee handbag, with a strap just short enough to shove my shoulder through, but for totes, anything goes! If you peruse my blog, you’ll see quite an assortment. I’d say the one thing they all have in common is that they’re colorful. (By the way, my Booga, which turned out to be smaller than I thought and WAY too orange is now enjoying life in Alaska, with Anne’s fabulous mom, who sincerely liked it!) Basically, I like wee bags for regular and out on the town use, and big bags of any shape for toting projects and more around. What handbag or bag are you carrying today? 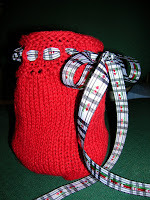 Do you use a separate bag to carry your knitting? I’m still carrying my Sidekick. I used my bag from the first exchange to carry my books and knitting to the beach, and it’s perfect for my baby blankie in progress at the moment. I also have my new Total Tote, and that’s loaded with my next sock project, ready for wherever I ride next. What other things do you enjoy knitting or crocheting? Socks. Small projects. I just found a sweater I want to do though, and while I’m not very far along, I’m enjoying the baby blanket I just started. Metal circs., although it depends on the project. I don’t mind dpns at all, but they too must be metal. I do use my Bryspun straights for dishcloths though. No bamboo or plastic. Snap, crackle, pop! Felted bag or otherwise? Bag, I want to do the B4 bag, but have to get a better grip on bobbles first. Then there’s the Bar Harbor Shell bag… Projects in general? I have several sweaters, a yoga mat bag (or is that a bag? ), a baby kimono, and so much more. Again, felting or otherwise? Felting, my life won’t be complete until I try Malabrigo. Otherwise? Bamboozle is my big desire at the moment, but check my blog, because I’m likely to buy some post-haste. What other hobbies do you have? Do you spin? Sew? Garden? Yoga, stamping, scrapbooking, my dogs… I do not spin and have no inclination. I wish I could sew, but Anne won’t stay long enough to teach me. I used to garden, but my back doesn’t like the bending and such. I’m much more inclined towards sweet than salty. I don’t care for hard candies, except for mints. And I mean mint mints. Indeed, there’s Mugsy the Jack Russell Terror, aka: the Crup, and Fred the Basset Hound. Our home revolves around keeping the princes happy. What kind of project best personifies you and why? What is your favorite part of Autumn? You can also share a special Autumn memory if you’d prefer! Tell us 3 things you would do if you won 10 million dollars in the lottery. Just three? Well, there’s the somewhat standard bit about the perfect yarn shop with some friends, but I’m going to give you three new things this time, not that hanging out with my favorite knitters every day wouldn’t be heaven. Travel. I’m talking yarn crawls with you guys, at your favorite spots, mine, and those must-sees. Nascar races galore, a knitters cruise, seeing Europe with my favorite cousin, Africa with a couple of special folks, etc. I’d also set up a foundation for training and educating fire fighters, especially volunteers. The world is changing, and training and knowledge will keep them safe, and allow them to perform more efficiently. Mark and I both have invested a lot of time in training, both our own and in training others, and it’s something I’m passionate about. Dearest Anne tagged me a while back, but was kind enough not to hit me over the head while I was on vacation. I’m also aware that I never tapped any other Rockin’ Girls for that award, but my time has been a bit thin, so forgive me, okay? Um… My serious back problems were just beginning. I felt a twinge, argued with the brand, spankin’ new personal trainer about what I should and shouldn’t be doing, given my known back issues (from my teens), but listened to Mr. Expert and pinched a nerve, again. I was also just a few weeks away from marrying my best friend, and let me tell you, you haven’t lived until you try to put the finishing touches on a wedding for 250+ of your closest friends and distant relations while on narcotic pain killers! LOL… Alzheimer’s already!? Ten years ago was easy. One year ago, not so much. Mourning the first summer vacation without Randy, my stepson. He opted to stay with his mom rather than do the beach thing with us. Ouch. 2. I interrupt when Mark is talking. 3. I have “safe places” which means I put things away and can’t find them later. 4. I am moody. It’s not a habit, but it’s something I’d like to change. 5. I am a rotten housekeeper. 4. Listening to music and singing along. 1. Those floppy, big bows Madonna inspired me to put in my hair in 1985. 5. The Guess jeans with the zippers at the ankles – not that I could get into them now anyway! And now, more joining has happened. I don’t have a button yet for SP11, but I’m in and waiting on my match. I’ve be remiss in noting that there’s another felted bag exchange! Y’all know about the Colors of Tea Swap (it’s my swap; I can call it something slightly different each time if I want!) which at this moment, is still open. Then, there’s the Vegan Pal 2 Swap, which is also still open. I can’t decide which option I want. I hate orange the color, but totally LOVE pumpkin, the food, so…?? That’s enough for now. I’m supposed to be working on the tea blog site, and I have more vacation excitement to share, and a BIG THANK YOU to make too, but… later.